The inline six-cylinder 2.8-liter engine is the biggest engine of the M52-series. The M52B28 was released in 1995 as a new engine for the E36 328i, E39 528i, and E38 728i models. The M52 engine series replaced the M50-series. This engine, like M50 engines, got an aluminum cylinder block with Nikasil layer on cylinder walls. For the North American market, the M52B28 features a cast iron engine blocks instead of aluminum ones, and only BMW Z3 model got engines with an aluminum cylinder block. That decision was made due to high levels of sulfur in the US gasoline, which has a corrosive effect on Nikasil leading to fast wear. Connecting rods are 135 mm long. Aluminum pistons have a compression height of 31.82 mm. Those numbers allowed getting in result "square engine" (84.0 x 84.0 mm bore and stroke). The M52 2.8L engine has an aluminum 32-valve DOHC cylinder head with variable valve timing system only for the intake (single VANOS). The M50TUB25 and M52B28 cylinder heads are interchangeable. The M52TU was released in 1998. It has some updates compare to the M52B. The big difference is dual VANOS (variable valve timing system for both camshafts), variable geometry intake manifold (DISA) and cast iron sleeves inside the block. Also, the engine got new pistons, connecting rods, electronic throttle body. M52TUB28 camshaft specs: duration 244/228 deg, valve lift 9.0/9.0 mm. The M52B28/M52TUB28 engine was produced until 2000 then was replaced by the newest M54B30 engine of M54 family. 1. The M52B28 engine easily can be overheated. Any overheating will destroy a cylinder head. 2. The engine has unreliable oil rings and consumes oil in large volume when they are really bad. 3. Clogged hydraulic tappets/lifters can cause ignition problems. The ECU will turn off the ignition for cylinders in which valves are not closed tight. The M52B28 has a more complicated design. Its engine life is shorter than M50 engines. Some problems are common to all M52 engines. 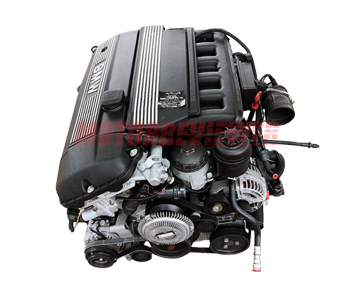 You can find detailed information about them in other M52-series engine reviews.